My quilting hiatus continues! Instead of chipping away at the half-dozen quilt projects I have planned, I’m focusing on smaller, faster-to-finish projects. Earlier this month it was pin cushions. This week, it’s Christmas ornaments. 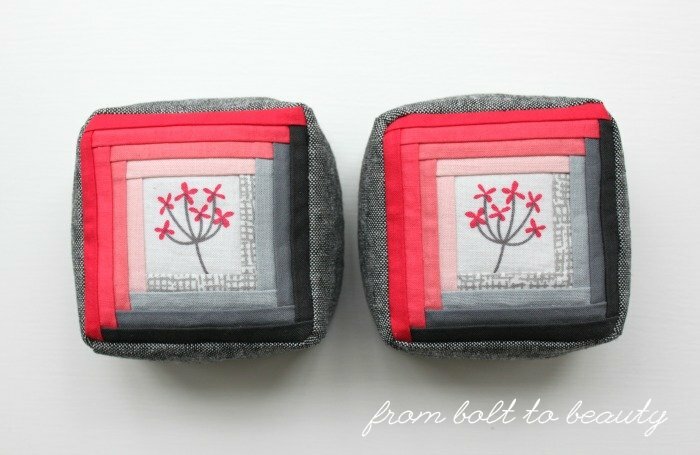 For the first batch, I started with a mini-charm pack of Basic Grey’s Juniper Berry, sewed up some four patches, and trimmed them down to 3½-inch squares. I decapitated some deer in the process (some squirrels did survive the trimming), but the results are still pretty sweet. No decapitated deer (or surviving squirrels) pictured here. 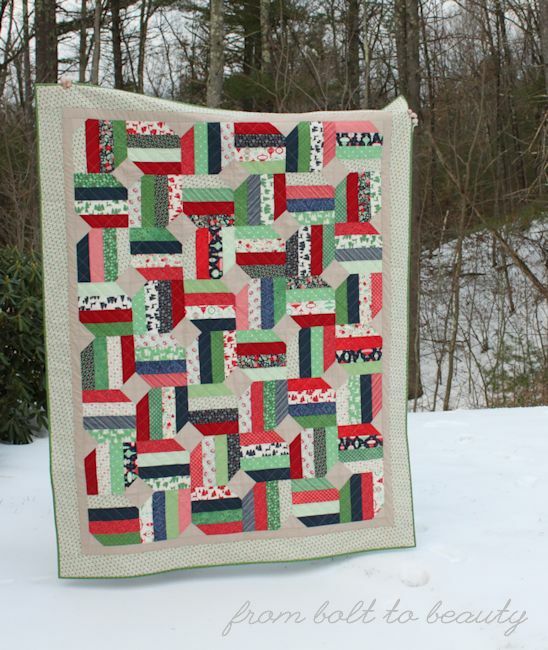 These blocks started out as 2-inch HSTs. 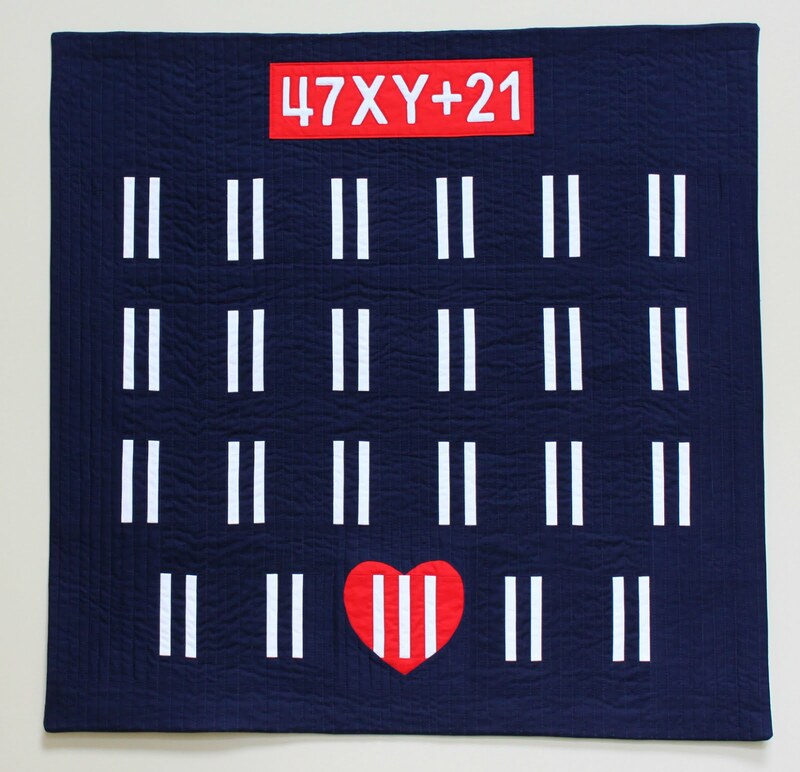 Once I sewed them up in four patches, they finished at 3½-inch squares, just like batch 1. Notice the stack of ornaments waiting to be bound! The funny thing about this process has been the binding. I was adamant about finishing the binding by machine, as I do for my regular quilt projects. After three ugly attempts, I gave up and opted to tack down the binding by hand. Not only does that technique look better at this scale, but I’m also enjoying the process. Go figure. I don’t foresee changing my approach to binding full-size quilts; I like the durability and look of a machine-attached binding on the throws I make. However, it’s nice to curl up on the couch at the end of the day and work on a project I can hold in my hands. As with my pin cushions, I made a small project big by planning to sew up a bunch. So far I have finished five and have two dozen more to go! This ornament decided to cooperate for a quick picture. After churning out quilt after quilt last year, I’m taking a break by planning and cutting quilt projects but not sewing a thing. Instead, I’m a small-project girl for the time being, ready to enjoy some quick finishes. Aren’t they the cutest?! 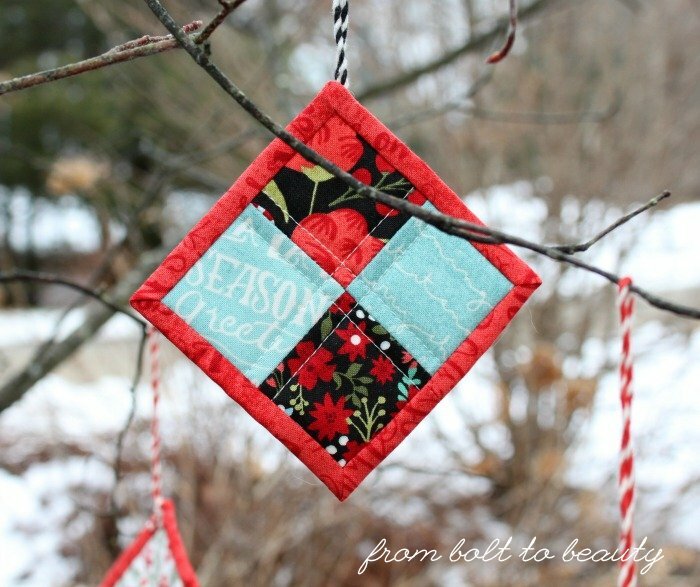 I bookmarked the tutorial, found on Mama Love Quilts, last summer, when it debuted. 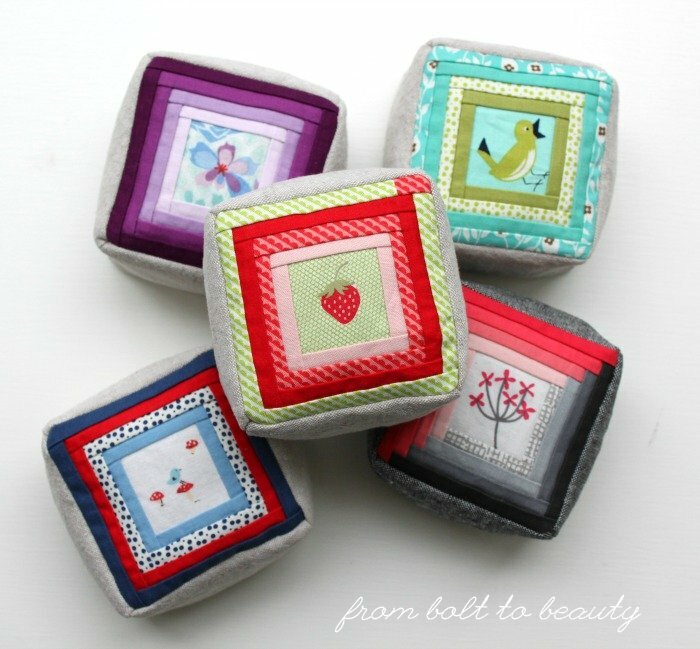 There’s something about the teeny-tiny log cabin blocks and chunky cube cushion that I find irresistible. 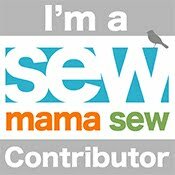 Once I had rooted through my scrap bin, dumping fabric of various sizes and colors all over my dining room floor, it seemed silly to stop at just one. To date, I’ve made eight, with plans for more. 1. 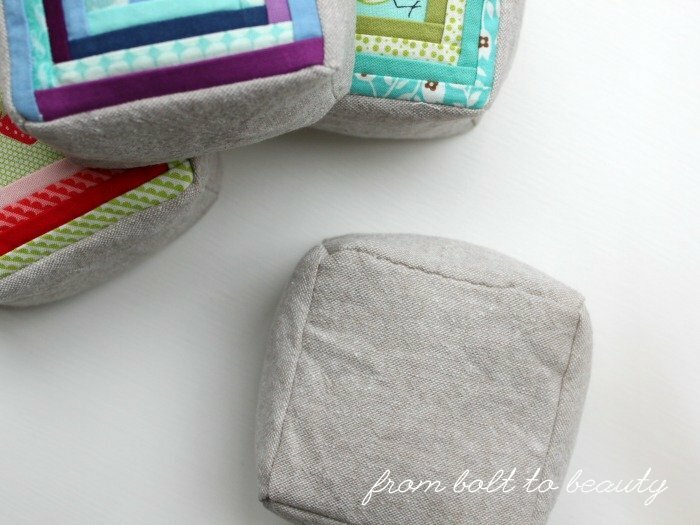 The hardest part of making these pin cushions is finding a starting point. The center square finishes at 1¼ inch. I have few novelty prints. Of those I do have, many were too big to use in this project. collection. He was just the right size! 2. The skinny logs in this work best with solids or super-small patterns. They finish at ¼ inch, and my attempts at using some less dense patterns, even though small, weren’t as successful. which were perfect for the scale here. 3. I tried some random combinations of fabrics, but I ended up preferring the structure of concentric squares or ombre gradations. I was so pleased with the gray and pink combination that I made two. 4. Hand-stitching is a turn-off for me, and these pin cushions required a little bit. 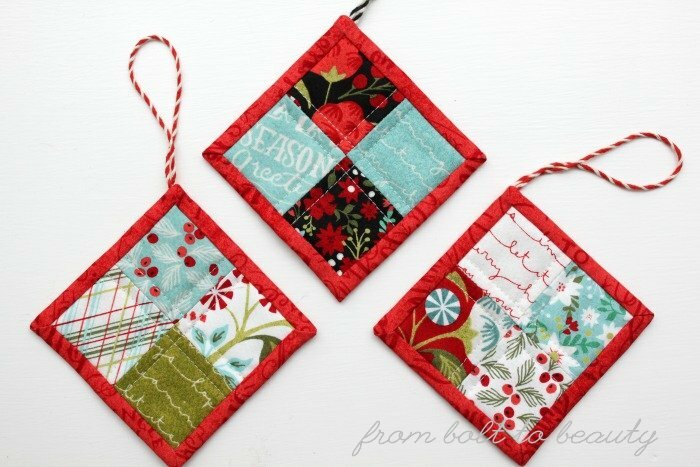 I consulted a tutorial from Meadow Mist Designs, and the hand-stitching ended up being fast and easy. That’s my ladder stitch. Looking good! 6. 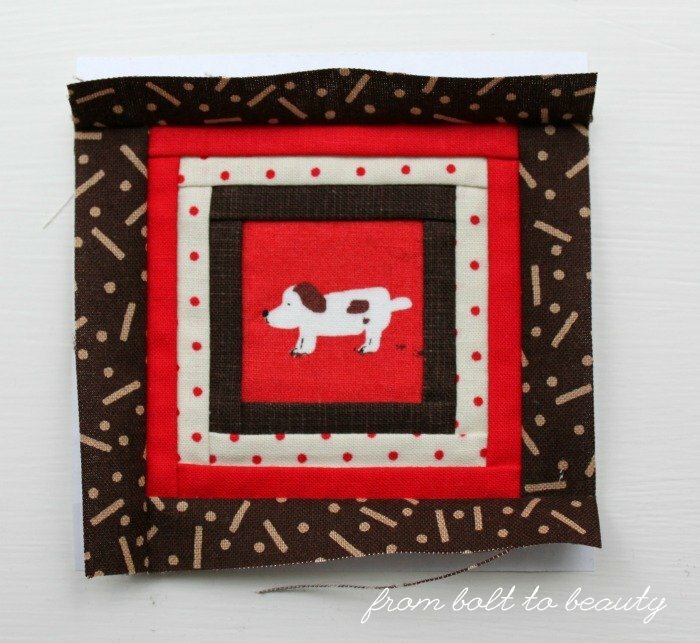 For those of you visiting from Scraptastic Tuesday ... My scrap strategy is to keep (and sort by color) any scraps that are 2½-inch squares or larger. These pin cushions had me rethinking that approach. 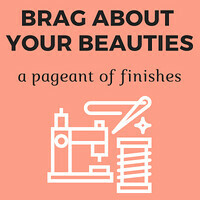 After all, the centers finish at just 1¼ inch—think of how many pin cushions I could have created with scraps that I’ve tossed! My inner voice of reason prevailed, however: I only need so many pin cushions in my life. Sure, I was able to get most of this fabric from my scrap bin, but my current system is working—no need to complicate things by keeping smaller bits! 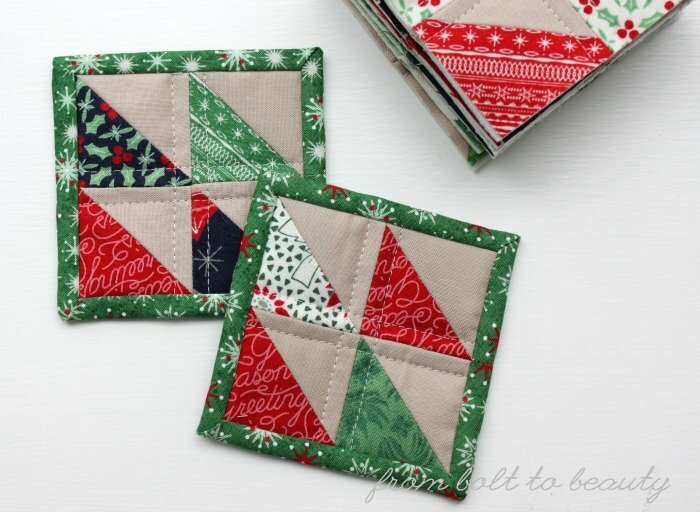 To make your own 3½-inch log cabin block and transform it into a pin cushion, see the tutorial at Mama Love Quilts. 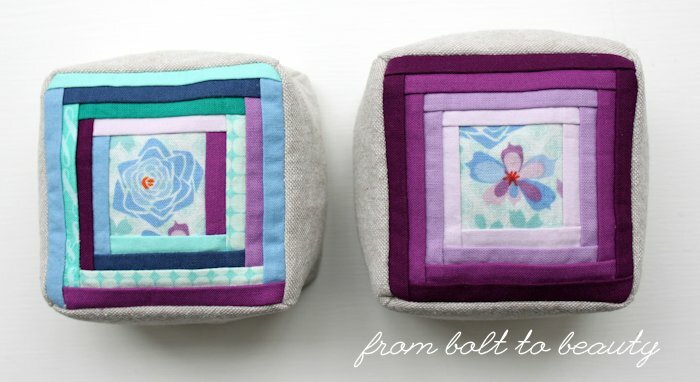 Pssst ... Know of any other fun pin cushion tutorials? Let us know about them in the comments!